Discover an Extraordinary Taste from Wales. Cheese was an important factor in Wales’ proud but tumultuous early 1900’s coal mining boom. The brave colliers (miners) depended heavily on cheese: high in nutrition, easy to keep and of good value, for energy during their long, strenuous days in the dark, hazardous mines. And the preference was strong! Because the miners needed to penetrate the taste bud destroying soot to enjoy their lunch. The favored meal of the collier was cheese. 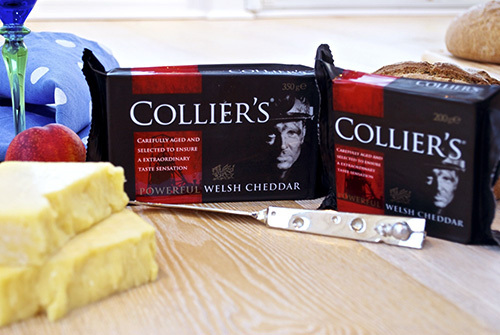 Multiple award-winning COLLIER’S Powerful Welsh Cheddar was passionately created to reflect the unique, powerful image of the collier. The cheese superbly captures the integrity and preference of that bygone era as well as Wales’ ancient Celtic cheese-making heritage. Made in the beautiful Welsh mountains of Denbighshire to a closely guarded traditional recipe, COLLIER’S is carefully matured up to 20 months to create an extraordinary taste sensation. The milk, collected from local farms, is carefully quality checked before being pasteurized. Rigorous checks continue throughout the cheese-making process to ensure every cheese named COLLIER’S is consistently the best example of the unique taste and texture that defines the brand. Salt deposits are clearly seen on the cheese’s surface which contributes to the fine character and is indicative of the age and high quality. Collier’s has a long, deep character with a wonderfully sharp yet slightly sweet taste that lingers on the palate for a delicious finish. It is outstanding for creating a distinct cheddar taste in recipes, salads, with cold meats or any time a dramatic taste sensation is desired. We can thank Wales for their brilliant actors and musicians like Catherine Zeta-Jones, Anthony Hopkins and Tom Jones, explorers such as George Everest, inventors like William Frost who patented the airplane and for the 16 signatories who lent their names to the Declaration of Independence. And now we can thank the Welsh for giving us a truly exceptional and powerful Cheddar eating experience.